Witamy! Many folks have asked us what was the inspiration for our own new cook book, and it was my Mom’s tome…nothing else. My Mom wrote this iconic cook book in 1967. It’s the gift that keeps on giving because it still sells a few hundred copies every year - all over the world. 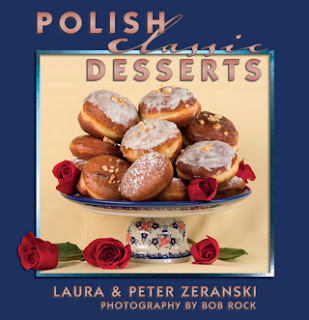 We’ve always loved Polish food and every time Laura made a dish from of my Mom’s book, we would find her notes on changes to the recipes, suggested over 35 years of continuous improvements. And of course Laura made some of her own improvements as well. So we approached Pelican Books, the current publishers, and proposed a new and improved version…with recipes that are updated for modern kitchens. After all, when Mom wrote the book we weren’t using microwaves, immersion blenders, or bullet choppers. Cuisinart was just a dream and there was no going "on line" to download the latest recipes. But Dr. Milbourn Calhoun, publisher of Pelican Publishing Company, suggested that we write a new book as part of their classic recipe series – 96 pages, upscale, lots of photography, and sold for a reasonable price. We gratefully agreed and off we went on our journey. At 18 years of age, I was the very first editor of The Art of Polish Cooking. Since English was not my Mom’s first language, she struggled a bit with spelling, grammar and tenses - all that stuff we were supposed to learn in middle school grammar class. So, under the assumption that some of that grammar actually stuck in my head, I was tasked to spend at least an hour a day, for weeks, reading and correcting each recipe and each story that told of the culture and tradition associated with Polish cuisine. I made hundreds of red pencil notes in the margins of smeary erasable typewriter paper. And the debates over how to turn a particular phrase…just went on and on. I was totally glad when the book was done. Today, as Mom is up in that “glorious kitchen above,” I can freely admit that I hurried through a lot of it. As we now read her pages more closely, my young age and anxiousness to “just get through it” kind of shows. But, I can also say very gratefully, that I was thoroughly enriched by going through the process (even though I had no clue back then). I tasted almost all the dishes she tested, and I absorbed volumes about the customs and traditions. There is a whole lot of great food in that book. 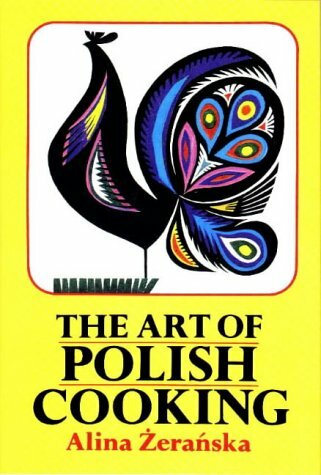 Ours may be prettier and our recipes have been refreshed for modern kitchens, but for any serious advocate of Polish cuisine, there should be a place on your shelf for The Art of Polish Cooking by Alina Zeranska. Today I’m thankful for going through it all. Thanks Mom! In Europe, back in the day, it was so tedious to squeeze cookies into different shapes from a pastry bag. Today with a modern cookie gun, creating and enjoying these old fashioned goodies can be a snap and more fun as well. Combine all ingredients and mix well. Load the cook gun and create a variety of small fun shapes on a buttered cookie sheet. Bake at 275 degrees for 30 to 40 minutes. Smacznego! Yields about 6 dozen, depending on size. What a wonderful story, carrying on your mother's work! I wish you great success with your new book. I love these cookies, by the way.